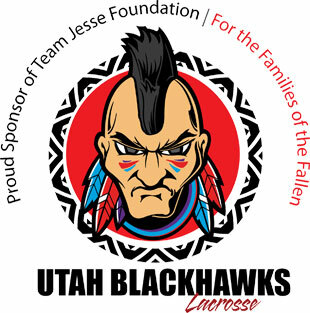 02.07.2014 - By Press Releases The Utah Blackhawks are proud to announce our partnership with the Team Jesse Foundation. The mission of the Foundation is helping families of fallen soldiers in honor of SSG Jesse Williams. They are also committed to supporting the efforts of as many other charitable military organizations as possible by raising money through awareness and events. This charity has deep roots in the game of lacrosse on the East Coast, and we are looking forward to having their positive influence in the lives our players. In this next endeavor as a lacrosse club, we hope our success will not be gauged solely on wins and losses, but in the partnership with a charity that has one of the greatest missions we can think of; taking care of the families of the men and women who gave their lives taking care of our great Nation. Longtime friends Kevin Mincio and Matt Corry, who were teammates on the University of Connecticut lacrosse team, founded team Jesse in 2010. However, the story of the foundation started years earlier with a simple promise. In 2001, Kevin Mincio was working on Wall Street as a Vice-President for Goldman Sachs. He witnessed the attacks on the World Trade Center on September 11, 2001, and watched the towers fall. Shortly after that experience, Kevin left his job to join the Army. He entered as an infantryman, training at Fort Benning, Georgia before being stationed at Fort Lewis, Washington. He was deployed to Iraq in 2003. Along the way he met SSG Jesse Williams, and they became close friends. Before Jesse left for his 2nd tour of duty, after earning a Purple Heart in his 1st tour, he asked Kevin to “look after” his daughter Amaya in the event he didn’t make it back. Kevin made a promise to do so. Sadly, on April 8, 2007, Jesse was killed by sniper fire in Baqubah, Iraq. He was just 25 years old. Amaya Williams was 11 months old and left without a father. Kevin immediately began to fulfill his promise to Jesse by making sure Amaya’s future was secure. However, Kevin soon realized that there were “many more Amaya’s” out there – children whose families had made the ultimate sacrifice for country. Team Jesse grew out of what was initially going to be a summer lacrosse tournament team entered into the 2007 Lax Vegas Lacrosse Tournament, made up of former players from Kevin and Matt’s alma mater, and other friends the great game of lacrosse had given them through the years. Inspired to do more in the Fall of 2010, they founded the Team Jesse Foundation, a 501(c)(3) charitable organization, with the help of Eileen Tang, Heather Hager, and support of family, friends and other connections throughout the entire lacrosse community, they got to work raising money and sharing the story of Jesse, a courageous soldier who gave the ultimate sacrifice and left his family too soon. In 2011 Kevin put together a cross-country bike ride to raise awareness for families of the fallen. He and his friend Matt Sauri left on June 9th from Jesse’s gravesite in Santa Rosa, California on what would have been Jesse’s 30th birthday. They ended at Ground Zero on the 10th Anniversary of the 9/11 attacks on September 11, 2011. This journey was documented in the award-winning film “The Long Ride Home.” Since then Team Jesse have tirelessly continued fundraising efforts, including 9/11 Heroes Runs on both the West and East Coasts. To date, by partnering with like-minded organizations, they have provided support for 63 families, helping to send 50 to attend bereavement camps, and aiding 13 by challenge grants and scholarships. The foundation is hard at work to increase that number in 2014 and beyond. Coach Jeff Brzoska, one of the original Utah Blackhawks coaches and Park City resident, brought the story of Team Jesse to the club after a trip home to Connecticut. While catching up with an old friend, and High School teammate, Matt Corry, Jeff was educated on the beginnings of Team Jesse and all it hopes to accomplish in the future. After hearing the story he knew he had to be involved and hoped to get the club to partner with the foundation as well. Like all coaches, Jeff wanted his kids to be great athletes and good sports on the field, but he also wanted them to have a sense of community and appreciation for military service. Jeff’s passion for Team Jesse made it an easy decision for the Blackhawks to support the cause and we made our first, of many to come, donations this past January. The Blackhawks are a Utah based, 501(c)3, non-profit lacrosse club dedicated to providing lacrosse opportunities, to players of all ages, who want to develop and improve their skills year-round. Our goal is to bring together players who love to play lacrosse, who are committed to development, who understand the importance of team unity, and who want to learn every facet of the game, both on and off the field. In an effort to give players the resources to succeed the Blackhawks have assembled a coaching staff that rivals any Club team in the West, made up of former and current College lacrosse players and some of the biggest coaching names in Utah lacrosse history.